Misha (A Class World Champ)/Bastiaan are incredible sailors, foxxy Booth (Olympic medalist) and son write a so nice and performing family story, Vendée Globe heroe and (one of the) world best crew F17 Matthieu, are very good and professional, but not enough to beat Hugues Styles/ Richard Mason and Billy Besson / Jérémy Lagarrigue those guys are simply the stars of our sport . Special notice to the 6th and first mixed : Moana Vaireaux and Manon Audinet, Moana find in Tuscany his better result on a F18 world ever I think, working hard in the french squad is a key andplease do notice also they were sailing not on a brand new boat. F18 level is for the moment above Olympic circus, people are older, more experience, and the boat need « muscle ». Bravo Manon Audinet. 4 french in the top 10, 2 aussies, 1 brit, 1 « spanish », 1 italian, 1 ned. Obviously our friends from Holland are very focus on Nacra 17. The F18 people are feeding the Olympic circus, the old nation are still strong, former Tornado people like the greek Iordanis Paschalidis (I’ll make a post about this great and nice people) and Gustaf Dyrssen who’s never come back to monohull (ha ha !) are in the top 12, people from Oman Al Hadi / Ashim are 15, that is amazing and they are the best from the « F18 new world », south american are in the top 20. That is a nice progress. From USA Taylor/Whitehead are best Youth, Romain and Valentin Bellet did a great regatta and are the second Youth, Van Dijk/Kleisweg from holland third. Only 13 youth (< 23 years old) on this world, 7 youth french. Just a word about the silly idea of the french MNA to kill Hobie 16 series for the youth, especially when you consider that the top french sailors (except Gabart) are from this old boat but so good fleet. 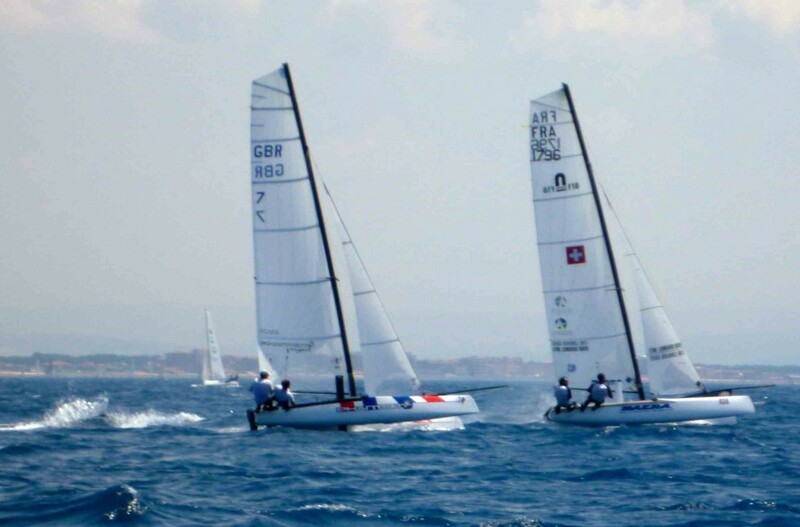 This Italian F18 world Championship has been for the sailors one of the best ever. About the boat, Olivier Bovyn can be happy, F18 concept works despite some blocks and floating daggerboard or 3 mm too long boat. Billy and Jérémie win the world on a boat just out of the box in Carnac… That is F18 spirit. This said the competition equity gain to have crystal clear procedure when making the 4 groups for qualifications. Be member of yellow and green group was 5 point a race « malus » so 30 point in total for qualification.The moment to introduce the concept of « Gentleman sailors » (specific podium for sailors from second half of national ranking list) thas has been created by the french F18 association since 2010. On shore pasta party was a very good moment, e-communication, video and big screen can be axes to improve the fest. 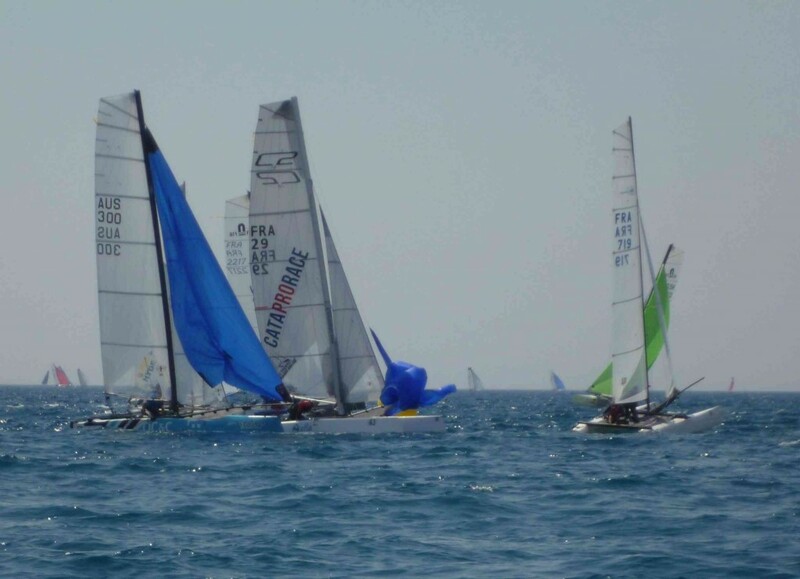 On the water perfect wind condition and great people and friends from Follonica (I love Negrino ) make amazing races. Comité was good, important to notice, jury was fast but not furious, very good thing.